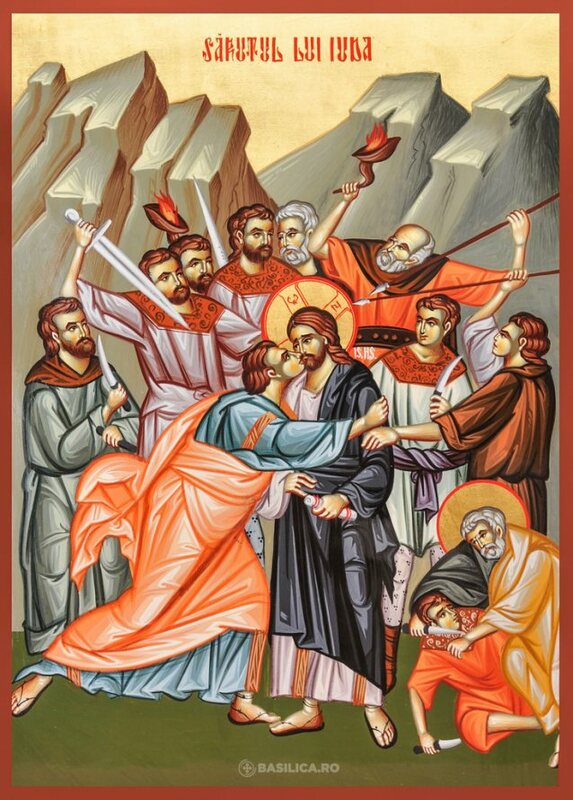 The holy Great Martyr Euphemia suffered martyrdom in the city of Chalcedon in the year 304, during the time of the persecution against Christians by the emperor Diocletian (284-305). One and a half centuries later, at a time when the Christian Church had become victorious within the Roman Empire, God deigned that Euphemia the All-Praised should again be a witness and confessor of the purity of the Orthodox teaching. In the year 451 in the city of Chalcedon, in the very church where the glorified relics of the holy Great Martyr Euphemia rested, the sessions of the Fourth Ecumenical Council (July 16) took place. 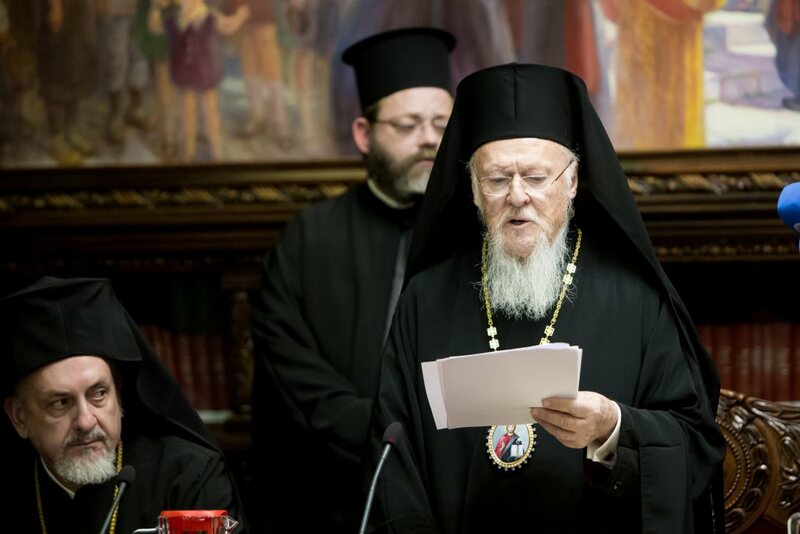 The Council was convened for determining the precise dogmatic formulae of the Orthodox Church concerning the nature of the God-Man Jesus Christ. This was necessary because of the widespread heresy of the Monophysites [“mono-physis” meaning “one nature”], who opposed the Orthodox teaching of the two natures in Jesus Christ, the Divine and the Human natures (in one Divine Person). The Monophysites falsely affirmed that in Christ was only one nature, the Divine [i.e. that Jesus is God but not man, by nature], causing discord and unrest within the Church. At the Council were present 630 representatives from all the local Christian Churches. On the Orthodox side Anatolius, Patriarch of Constantinople (July 3), Juvenal, Patriarch of Jerusalem (July 2), and representatives of Saint Leo, Pope of Rome (February 18) participated in the conciliar deliberations. The Monophysites were present in large numbers, headed by Dioscorus, the Patriarch of Alexandria, and the Constantinople archimandrite Eutychius. The holy Patriarch Anatolius of Constantinople proposed that the Council submit the decision of the Church dispute to the Holy Spirit, through His undoubted bearer Saint Euphemia the All-Praised, whose wonderworking relics had been discovered during the Council’s discussions. The Orthodox hierarchs and their opponents wrote down their confessions of faith on separate scrolls and sealed them with their seals. They opened the tomb of the holy Great Martyr Euphemia and placed both scrolls upon her bosom. Then, in the presence of the emperor Marcian (450-457), the participants of the Council sealed the tomb, putting on it the imperial seal and setting a guard to watch over it for three days. During these days both sides imposed upon themselves strict fast and made intense prayer. 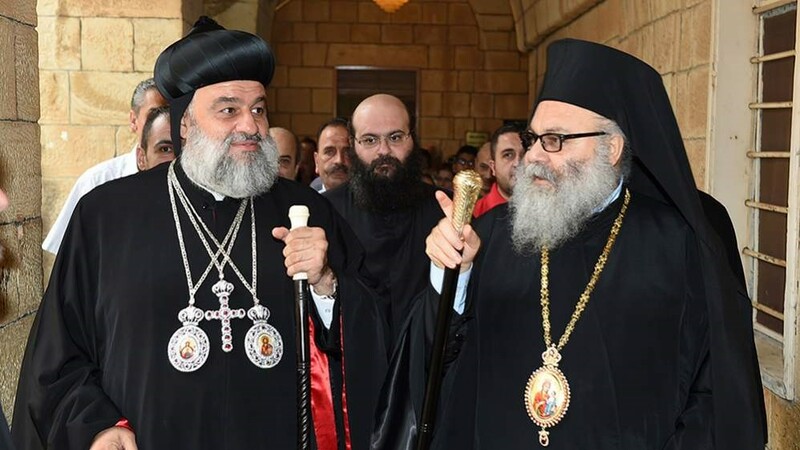 After three days the patriarch and the emperor in the presence of the Council opened the tomb with its relics: the scroll with the Orthodox confession was held by Saint Euphemia in her right hand, and the scroll of the heretics lay at her feet. 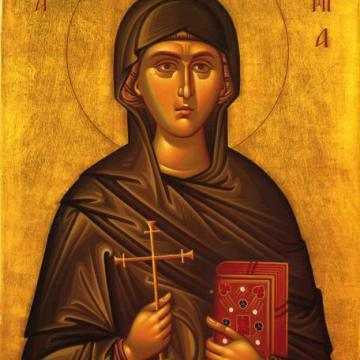 Saint Euphemia, as though alive, raised her hand and gave the scroll to the patriarch. After this miracle many of the hesitant accepted the Orthodox confession, while those remaining obstinant in the heresy were consigned to the Council’s condemnation and excommunication. After an invasion by the Persians during the seventh century, the relics of Saint Euphemia were transferred from Chalcedon to Constantinople, into a newly built church dedicated to her. Many years later, during the period of the Iconoclast heresy, the reliquary with the relics of the saint was cast into the sea by order of the Iconoclast emperor Leo the Isaurian (716-741). The reliquary was rescued from the sea by the ship-owning brothers Sergius and Sergonos, who gave it over to the local bishop. The holy bishop ordered that the relics be preserved in secret, beneath a crypt, since the Iconoclast heresy was continuing to rage. A small church was built over the relics, and over the reliquary was put a board with an inscription stating whose relics rested within. When the Iconoclast heresy was finally condemned at the holy Seventh Ecumenical Council (in the year 787), during the time of Saint Tarasius, Patriarch of Constantinople (784-806) and the emperor Constantine VI (780-797) and his mother Saint Irene (797-802), the relics of the holy Great Martyr Euphemia were once again solemnly transferred to Constantinople. Saint Olga was the wife of the Kievan Great Prince Igor. The struggle of Christianity with paganism under Igor and Olga, who reigned after Oleg (+ 912), entered into a new phase. The Church of Christ in the years following the reign of Igor (+ 945) became a remarkable spiritual and political force in the Russian realm. The preserved text of a treaty of Igor with the Greeks in the year 944 gives indication of this: it was included by the chronicler in the “Tale of Bygone Years,” under the entry recording the events of the year 6453 (945). The God-wise Olga entered into history as a great builder of the civil life and culture of Kievan Rus. The chronicles are filled with accounts of her incessant “goings” throughout the Russian land with the aim of the well-being and improvement of the civil and domestic manner of life of her subjects. Having consolidated the inner strengthening of the might of the Kiev great-princely throne, thereby weakening the influence of the hodge-podge of petty local princes in Rus, Olga centralized the whole of state rule with the help of the system of “pogosti” (administrative trade centers). In the year 946 she went with her son and retinue through the Drevlyani land, “imposing tribute and taxes”, noting the villages, inns and hunting places, liable for inclusion in the Kiev great-princely holdings. Princess Olga exerted much effort to fortify the defensive might of the land. The cities were built up and strengthened, Vyshgorod (or Detintsa, Kroma) they enclosed with stone and oak walls (battlements), and they bristled them with ramparts and pallisades. Knowing how hostile many were to the idea of strengthening the princely power and the unification of Rus, the princess herself lived constantly “on the hill” over the Dneipr, behind the trusty battlements of Kievan Vyshgorod (“Verkhna-gorod” or “Upper-city”), surrounded by her faithful retainers. Two thirds of the gathered tribute, as the chroniclers testify, she gave over for the use of the Kiev “veche” (city-council), and the remaining one third went “to Olga, for Vyshgorod” — for the needs of building fortifications. And to the time period of Olga, historians note the establishment of the first state frontiers of Russia — to the west, with Poland. Heroic outposts to the south guarded the peaceful fields of the Kievans from the peoples of the Wild Plains. Foreigners hastened to Gardarika (“the land of cities”), as they called Rus, with merchandise and craftwares. Swedes, Danes, Germans all eagerly entered as mercenaries into the Russian army. The foreign connections of Kiev spread. This furthered the developement of construction with stone in the city, the beginnings of which was initiated under Olga. The first stone edifices of Kiev — the city palace and Olga’s upper enclosure — were discovered by archaeologists only but in this century. 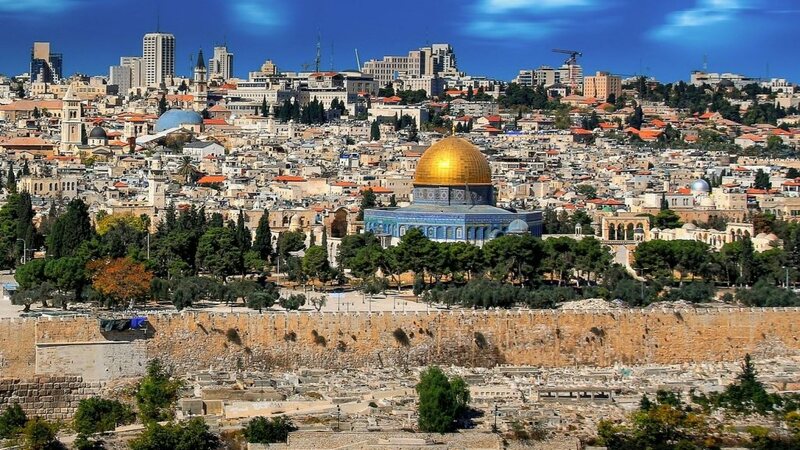 (The palace, or more properly its foundations and remains of the walls were found in excavations during the years 1971-1972). In her heart the wise Olga found the desire for holy Orthodoxy, and she made the decision to become a Christian. The sacrament of Baptism was made over her by the Constantinople Patriarch Theophylactus (933-956), and her godfather was the emperor Constantine Porphyrogenitos (912-959). At Baptism she was given the name Helen in honor of the holy Equal of the Apostles Helen (May 21), the mother of Saint Constantine, and she also had been the discoverer of the Venerable Wood of the Cross of the Lord. 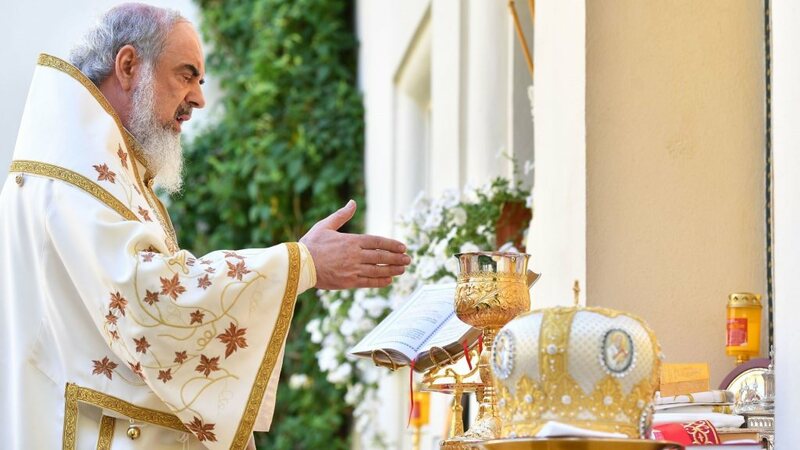 In an edifying word spoken at the conclusion of the rite, the Patriarch said: “Blessed are you among Russian women, for you have forsaken the darkness and have loved the Light. The Russian people shall bless you in all the future generations, from your grandson and great-grandson to your furthermost descendants.” He instructed her in the truths of the Faith, the churchly rules and the rule of prayer, he explained the commands about fasting, chastity and charity. “She, however,” says the Monk Nestor, “bowed her head and stood, literally like a sponge absorbing water, listening to the teaching, and bowing down to the Patriarch, she said, “By your prayers, O Master, let me be preserved from the wiles of enemies”. It is in precisely this way, with a slightly bowed head, that Saint Olga is depicted on one of the frescoes of the Kiev Sophia cathedral, and likewise on a Byzantine miniature contemporary to her, in a manuscript portrait of the Chronicles of John Scilitius in the Madrid National Library. The Greek inscription, accompanying the miniature, terms Olga “Archontissa (i.e. ruler) of Rus,” “a woman, Helga by name, who came to the emperor Constantine and was baptized”. The princess is depicted in special head attire, “as a newly-baptized Christian and venerable deaconess of the Russian Church.” Beside her in the same attire of the newly-baptized — is Malusha (+ 1001), the future mother of the Equal of the Apostles Saint Vladimir (July 15). For one who had originally so disliked the Russians as did the emperor Constantine Porphyrigenitos, it was no trivial matter for him to become the godfather to the “Archontissa of Rus”. In the Russian chronicles are preserved narratives about this, how resolutely and on an equal footing Olga conversed with the emperor, amazing the Greeks by her spiritual depth and wisdom of governance, and displaying that the Russian nation was quite capable of accepting and assimilating the highest attainments of the Greek religious genius, the finest fruition of Byzantine spirituality and culture. And thus by a peaceful path Saint Olga succeeded in “taking Constantinople”, something which no other military leader before her had ever been able to do. According to the witness of the chronicles, the emperor himself had to admit, that Olga “had given him the slip” (had outwitted him), and the popular mind, jumbling together into one the traditions about Oleg the Wise and Olga the Wise, sealed in its memory this spiritual victory in the bylina or folk-legend entitled “Concerning the Taking of Constantinople by Princess Olga”. In his work “About the Ceremonies of the Byzantine Court,” which has survived to the present day in just one copy, Constantine Porphyrigenitos has left us a detailed description of the ceremony surrounding the stay of Saint Olga at Constantinople. He describes a triumphant reception in the famed Magnaura palace, beneathe the singing of bronze birds and the roars of copper lions, where Olga appeared with an impressive retinue of 108 men (not counting the men of Svyatoslav’s company). And there took place negotiations in the narrower confines of the chambers of the empress, and then a state dinner in the hall of Justinian. And here during the course of events, there providentially met together at one table the four “majestic ladies”: the grandmother and the mother of holy Equal of the Apostles Saint Vladimir (Saint Olga and her companion Malusha), and the grandmother and the mother of Saint Vladimir’s future spouse Anna (the empress Helen and her daughter-in-law Theophano). Slightly more than half a century would pass, and at the Desyatin church of the Most Holy Theotokos at Kiev would stand aside each other the marble tombs of Saint Olga, Saint Vladimir and “Blessed Anna”. Moreover, the wily emperor, after reporting such details as would underscore how “Olga had given him the slip”, also presents a difficult riddle for historians of the Russian Church. This is it: Saint Nestor the Chronicler relates in the “Tale of Bygone Years” that the Baptism of Olga took place in the Biblical year 6463 (955 or 954), and this corresponds to the account of the Byzantine chronicles of Kedrinos. Another Russian Church writer of the eleventh century, Yakov Mnikh, in his work “Eulogy and Laudation to Vladimir… and how Vladimir’s Grandmother Olga was Baptized”, speaks about the death of the holy princess (+ 969) and he notes that she lived as a Christian for fifteen years, and he places the actual date of Baptism as the year 954, which corresponds within several months to the date indicated by Nestor. In contrast to this, describing for us the stay of Olga at Constantinople and providing the precise dates of the receptions given in her honor, Constantine Porphyrogenitos has us to understand in no uncertain terms that all this occurred in the year 957. Amidst all this, in spite of her failed attempts at establishing the Church hierarchy within Rus, Saint Olga, after becoming a Christian, zealously devoted herself to efforts of Christian evangelization among the pagans, and also church construction: “demanding the distressing of demons and the beginning of life for Christ Jesus”. She built churches: of Saint Nicholas and the church of the Holy Wisdom at Kiev, of the Annunciation of the Most Holy Theotokos at Vytebsk, and of the Holy Life-Creating Trinity at Pskov. Pskov from that period has been called in the chronicles the Domicile of the Holy Trinity. The church, built by Olga at the River Velika at a spot pointed out to her from on high, according to the chronicler, by a “light-beam of the Thrice-Radiant Divinity”, stood for more than one and an half centuries. In the year 1137 holy Prince Vsevolod-Gabriel (February 11) replaced this wooden temple with one made of stone, which in turn in 1363 was rebuilt and replaced finally with the presently existing Trinity cathedral. Saint Olga did much to memorialize the first Russian confessors of the Name of Christ: over the grave of Askold the Saint Nicholas church was built, where according to certain accounts, she herself was afterwards interred. Over the grave of Dir was built the afore-mentioned Sophia cathedral, which stood for half a century and burned in the year 1017. On this spot Yaroslav the Wise later on built a church of Saint Irene in 1050, but the sacred items of Olga’s Sophia temple were transferred into a stone church of the same name now standing as the Kiev Sophia, started in 1017 and consecrated about the year 1030. In the Prologue of the thirteenth century, it says about the Olga Cross: “for It is now at Kiev in Saint Sophia in the altar on the right side.” The plundering of Kiev’s holy things, which after the Mongols was continued by the Lithuanians who captured the city in 1341, did not spare even this. Under Jagiello in the period of the Liublin Unia, which in 1384 united Poland and Lithuania into one state, the Olga Cross was snatched from the Sophia cathedral and carried off by the Catholics to Lublin. Its further fate is unknown. But even in Olga’s time there were at Kiev among the nobles and retainers no few people who, in the words of Solomon, “hated Wisdom”, and also Saint Olga, for having built Wisdom’s temple. Zealots of the old paganism became all the more emboldened, viewing with hope the coming of age of Svyatoslav, who decidedly spurned the urgings of his mother to accept Christianity, and even becoming angry with her over this. It was necessary to hurry with the intended matter of the Baptism of Rus. The deceit of Byzantium, at the time not wanting to promote Christianity in Rus, played into the hands of the pagans. In search of a solution, Saint Olga looked to the west. No contradiction here yet existed. Saint Olga (+ 969) belonged still to the undivided Church (i.e. before the Great Schism of 1054), and she had scant possibility to study the theological points involved between the Greek and Latin Creeds. The opposition of West and East presented itself to her first of all as a political rivalry, of secondary importance in comparison with her task, the establishment of the Russian Church and the Christian enlightenment of Rus. Saint Olga glorified God with good deeds in all things, and God glorified her. Under holy Prince Vladimir, ascribed by some as occurring in the year 1007, the relics of Saint Olga were transferred into the Desyatin church of the Dormition of the Most Holy Theotokos and placed within a special sarcophagus, such as was customary to enclose the relics of saints in the Orthodox East. “And hear ye concerning a certain miracle about her: the grave of stone is small in the church of the Holy Mother of God, this church built by the blessed Prince Vladimir, and in the grave is the blessed Olga.